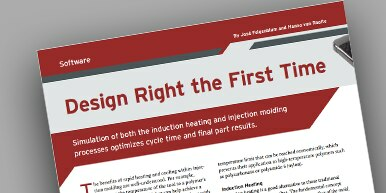 This article, originally published in MoldMaking Technology magazine, shows how simulation of induction heating and injection molding helps optimize cycle time and final part results. The benefits of rapid heating and cooling within injection molding are well understood. Increasing the temperature of the tool to a polymer’s glass-transition temperature helps achieve a high-gloss, high-quality surface finish as well as stronger weld lines, elimination of aesthetic surface defects and lower injection pressures. In fiber-filled parts, surface quality is improved significantly due to the formation of a resin-rich surface layer. Unfortunately, these benefits can be diminished by the long cycle times necessary for the mold to heat up prior to injection and to cool after filling. Induction heating is a good alternative to these traditional heating and cooling approaches. It provides more flexibility for controlling which areas of the mold are heated and what temperature each of those areas reaches. With induction heating, the mold can be heated appropriately for high- and low-temperature polymers with the added benefit of shorter cycle times and lower energy consumption. Designing an induction heating system comes with its own set of challenges. Simulation provides a relatively low-cost option for experimenting with induction heating (and other technologies), enabling molders to evaluate the potential benefits for individual applications early in the process. Simulation also helps ensure that a system is designed correctly and will perform as desired. This article explores the advantages of induction heating and explains how simulation makes it easier for mold designers to use this technique to shorten cycle time in a variety of applications.